MiFID II will be written into national law by July 2017, with full compliance required by 3 January 2018. Most firms on both the buy-side and sell-side understand that MiFID II is substantially changing the market and competitive landscape and are appreciating the significance of the potential commercial implications. MiFID II will produce clear winners and losers as European research revenues fall by 50% or approximately £1.5bn. With an increasing number of buy-side firms choosing to pay for research out of their P&L, pressure on sell-side firms to deliver quality research at a pre-agreed price is significant. Sell-side firms need to rapidly assess what they need to do to be MiFID II compliant, and capitalise on the market disruption to strengthen their relative position. Stratevolve has developed a fast, efficient and cost effective methodology for sell-side firms to assess their readiness and response to MiFID II. Developed on the back of over 3 years of research and hundreds of conversations with both buy-side and sell-side firms, the MiFID II Fast Track Diagnostic is designed to give clear guidance on compliance issues and identify business opportunities. 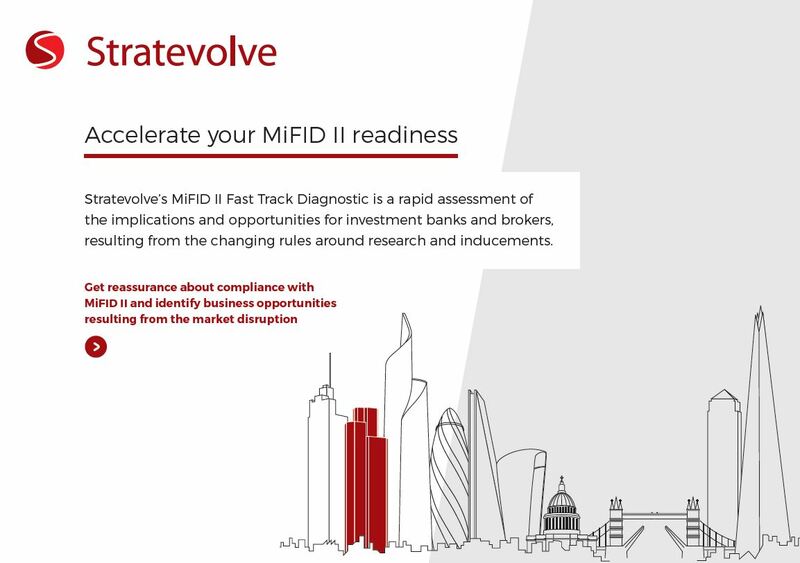 Click on the image to find out more about how Stratevolve’s MiFID II Fast Track Diagnostic can accelerate your understanding of the implications of MiFID II as it relates to research and inducements. Alternatively, contact Glenn Poulter to discuss your requirements. Find out more about how Stratevolve’s MiFID II Fast Track Diagnostic can accelerate your understanding of the implications of MiFID II as it relates to research and inducements. Strategic IT – what is your one next step?